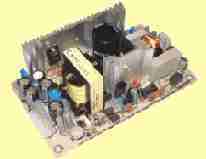 To better serve the 48 volt telecommunication standard we have assembled a group of power supplies that either output -48 volts, or input 48 volts to power ATX computers, 5 volts to operate switches, radios or routers, or other applications running in conjuction with telecommunications equipment. 48 volts has advantages for other applications because it is a safe voltage, but it is high enough to limit the amount of current needed to transfer medium power levels. Also for solar systems with 48 volt busses. This 6 amp 24VDC output fully isolated dc/dc converter is useful for powering 24 volt equipment in 48 volt telecomunnication stations, forklifts, etc. 75 watt, 15 amp 5 volt output. Input range 18VDC to 75VDC. 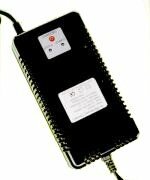 These fully potted 414 watt switchmode voltage DC to DC reducers are used to power 12 volt equipment on forklifts and other industrial equipment. Input range is 24 to 48 volts, which covers 26 volt equipment.